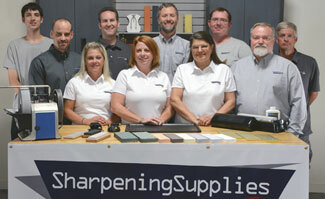 With the introduction of the Work Sharp Culinary line, Work Sharp brings their proven flexible belt sharpening to commercial kitchens. The E3 emphasizes a simple approach to sharpening. It is designed to make sharpening fast, easy and consistent, so you can concentrate on cooking, not on sharpening. Flexible abrasive belts are commonly used in the manufacture of knives because of their effectiveness and efficiency, and they work just as well for day-to-day sharpening. Work Sharp Culinary belts are specially designed to be extra flexible for fast but gentle material removal suitable for even the finest cutlery. Three Red P120 Belts are included with the machine, one installed and ready to use, and two stored in the machine. Replacement Belts are available. The E3 features fixed, non-removable guides that sharpen to 17°, providing an excellent, general-purpose angle on culinary knives. The E3 has two operating speeds for more aggressive sharpening and finer finishing. The E3 includes an 8" Dual Surface Ceramic Honing Rod for the finishing and maintenance of your knives. After sharpening on the E3, use the fine side of the rod to finish your knife to razor sharpness. In between sharpening sessions, use the coarse side to quickly refresh an edge. Built-in guides on the handle of the Ceramic Hone provide a perfect reference for quickly creating a micro-bevel consistently. Q. Will the belts for the Work Sharp Culinary Knife Sharpener fit other Work Sharp sharpeners? Q. What is the grit of the belts for the Work Sharp Culinary Knife Sharpener? A. The belts are 120 grit.